You must be a member of the Cambridge DinnerNations Group to attend this activity. Would you like to join this group? Hello Dinner Group and members of the Cambridge community! How are you? I hope everybody had a happy and warm festive time. Taking the opportunity... I and Nina, we would like to thank once again for our Christmas dinner. It was really a lovely and special night, as it is the Christmas time. Settled in Cambridge, for years and years the Protected content , in my opinion, is still the best Turkish restaurant in the city. Mediterranean, Barbecue, Vegetarian and Halal that fit the bill. The ambience and decor are pleasant. The welcome and attention from the staff is genuine! Just as it is amazing to hear them speak in Turkish, while they are serving us. Which makes us think about planning a trip till Istanbul! 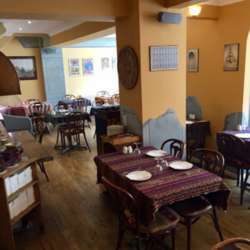 While we can sample the large selection of Starters, one of the owners could be cooking our fresh Main course and why not try the famous Turkish coffee even in the evening?? With a "touch" of Middle Eastern desserts? Looking forward to seeing old and new faces for the start of our Dinner Group Protected content !